Family operated country-inn atmosphere. 49 rooms. Quiet hilltop setting. Beautiful Mountain view. Exceptionally clean well maintained rooms. Private Balconies. Whirlpools. Fireplaces. Free Continental Breakfast including homemade muffins. Free Wi-Fi available throughout the property. 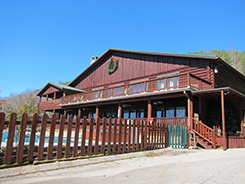 This group facility with gorgeous views of the Smoky Mountains sleeps 80 people in 2 beautiful lodges and 4 cabins. Both lodges have excellent kitchen facilities, dining room, gathering room, and fireplaces. Catering services area available. Outdoor swimming pool. Meeting space is offered for day long seminars. Relax at the outdoor pool complete with a nine-foot waterslide. Free, full hot breakfast, free high-speed Internet access, and guest rooms that offer king beds and other upgraded amenities, such as a spa tub and fireplace available in select rooms. 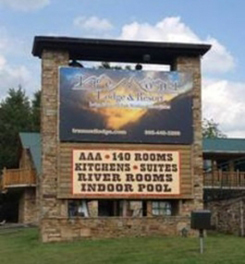 This unique 16 acre property with 132 hotel rooms comprised of standard one and two bedroom suites received a total transformation and remodeling when the property was sold in April 2014. 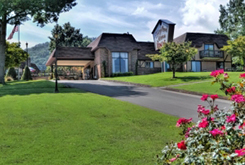 Each room and suite boasts new furnishings, carpeting, fixtures, flat screen televisions, a Keurig coffeemaker, fine linens, bedding, and much more. 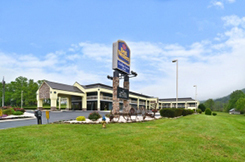 Spacious smoke free rooms, hand-scraped wood floors, 27″ flat screen stereo television with remote. Writing desk and sitting area in room, outdoor rockers for taking in the breathtaking views and beautiful sunsets. Black out curtains Hair dryer, coffee maker, refrigerator and microwave. Natural Paba Free soaps, hand lotion, shampoo, and conditioner. Complimentary in-room snacks, coffee and tea; Wi-Fi, free local calls, DirecTV.